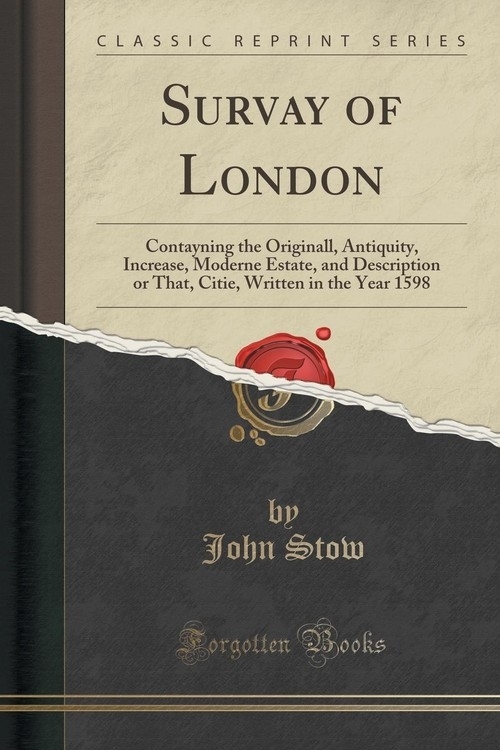 John Stow was a patriotic Londoner who lived throughout the whole reign of Elizabeth, and into the reign of James the First. He was born in 1525, in the year of the Battle of Pavia, where Francis the First of France was taken prisoner. He was four years old when Wolsey and Cardinal Campeggio presided over a Court at Blackfriars to consider the question of the divorce of Catherine of Aragon by Henry the Eighth. He was eleven years old when the first edition of a complete English Bible was produced by Miles Coverdale, and a copy of it was ordered to be placed in every church in England. He was twenty-two years old when Henry the Eighth died. In the reign of Edward the Sixth, John Stow, who had been born in the parish of St. Michael, Cornhill, the son (and grandson) of a tailor, completed his apprenticeship to the family business in the year 1549. In the days of the divorce of Queen Catherine, Stow had been a boy in a simple City household, many a time fetching halfpenny-worths of milk from the farm at the nunnery of the Franciscan sisters, who were called not Minorites, but Minoresses, whence, by abbreviation, Minories. Forty or fifty milch-kine were then fed on the meadows there, and a halfpenny was the price, in summer, of three pints, in winter, of two pints, of new milk hot from the cow. The boy's way to fetch milk was only along Leadenhall Street to the City gate, known as Aldgate, between Bevis Marks and Crutched Friars. Just outside that gate the house and farm of the Minories lay to the right of him.